In medical practice, doctors occasionally use the term "granuloma" in its more literal meaning: "a small nodule". Since a small nodule can represent anything from a harmless nevus to a malignant tumor, this usage of the term is not very specific. Examples of this use of the term granuloma are the lesions known as vocal cord granuloma (known as contact granuloma), pyogenic granuloma and intubation granuloma, all of which are examples of granulation tissue, not granulomas. 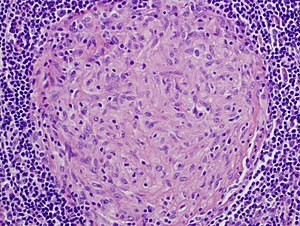 "Pulmonary hyalinizing granuloma" is a lesion characterized by keloid-like fibrosis in the lung, and is not granulomatous. Similarly, radiologists often use the term granuloma when they see a calcified nodule on X-ray or CT scan of the chest. They make this assumption since granulomas usually contain calcium, although the cells that form a granuloma are too tiny to be seen by a radiologist. The most accurate use of the term "granuloma" requires a pathologist to examine surgically removed and specially colored (stained) tissue under a microscope. Histiocytes (specifically macrophages) are the cells that define a granuloma. They often, but not invariably, fuse to form multinucleated giant cells (Langhans giant cell). The macrophages in granulomas are often referred to as "epithelioid". This term refers to the vague resemblance of these macrophages to epithelial cells. Epithelioid macrophages differ from ordinary macrophages in that they have elongated nuclei that often resemble the sole of a slipper or shoe. They also have larger nuclei than ordinary macrophages and their cytoplasm is typically more pink when stained with eosin. These changes are thought to be a consequence of "activation" of the macrophage by the offending antigen. The granulomas of tuberculosis tend to contain necrosis ("caseating tubercules"), but non-necrotizing granulomas may also be present. Multinucleated giant cells with nuclei arranged like a horseshoe (Langhans giant cell) and foreign body giant cells are often present, but are not specific for tuberculosis. A definitive diagnosis of tuberculosis requires identification of the causative organism by microbiologic cultures. ^ a b c d e f Mukhopadhyay S, Farver CF, Vaszar LT, Dempsey OJ, Popper HH, Mani H, Capelozzi VL, Fukuoka J, Kerr KM, Zeren EH, Iyer VK, Tanaka T, Narde I, Nomikos A, Gumurdulu D, Arava S, Zander DS, Tazelaar HD (Jan 2012). "Causes of pulmonary granulomas: a retrospective study of 500 cases from seven countries". J Clin Pathol. 65 (1): 51–57. doi:10.1136/jclinpath-2011-200336. PMID 22011444. ^ a b Woodard BH, Rosenberg SI, Farnham R, Adams DO (1982). "Incidence and nature of primary granulomatous inflammation in surgically removed material". American Journal of Surgical Pathology. 6 (2): 119–129. doi:10.1097/00000478-198203000-00004. PMID 7102892. ^ Hunter DC, Logie JR (1988). "Suture granuloma". British Journal of Surgery. 75 (11): 1149–1150. doi:10.1002/bjs.1800751140. PMID 3208057. ^ Chen KT, Kostich ND, Rosai J (1978). "Peritoneal foreign body granulomas to keratin in uterine adenocanthoma". Archives of Pathology and Laboratory Medicine. 102 (4): 174–177. PMID 580709. ^ Adams DO (1976). "The granulomatous inflammatory response. A review". American Journal of Pathology. 84 (1): 164–191. PMC 2032357. PMID 937513. ^ Travers P, Walport M (2008). Janeway's Immunobiology. Garland Science. p. 372. ^ a b c d Mukhopadhyay S, Gal AA (2010). "Granulomatous lung disease: an approach to the differential diagnosis". Archives of Pathology and Laboratory Medicine. 134 (5): 669–690. doi:10.1043/1543-2165-134.5.667. PMID 20441499. ^ Iannuzzi M, Rybicki BA, Teirstein AS (2007). "Sarcoidosis". New England Journal of Medicine. 357 (21): 2153–2165. doi:10.1056/NEJMra071714. PMID 18032765. ^ Cohen, Elizabeth (June 11, 2009). "Teen diagnoses her own disease in science class". CNN Health. Cable News Network. ^ Hartel PH, Shilo K, Klassen-Fischer M, et al. (2010). "Granulomatous reaction to Pneumocystis jirovecii. clinicopathologic review of 20 cases". American Journal of Surgical Pathology. 34 (5): 730–734. doi:10.1097/PAS.0b013e3181d9f16a. PMID 20414100. ^ Mukhopadhyay S, Katzenstein AL (2007). "Pulmonary disease due to aspiration of food and other particulate matter: a clinicopathologic study of 59 cases diagnosed on biopsy or resection specimens". American Journal of Surgical Pathology. 31 (5): 752–759. doi:10.1097/01.pas.0000213418.08009.f9. PMID 17460460. ^ "Foreign Body Granuloma". Journal of Maxillofacial and Oral Surgery. March 2011. ^ El Bouchti, I.; Ait Essi, F.; Abkari, I.; Latifi, M.; El Hassani, S. (2012). "Foreign Body Granuloma: A Diagnosis Not to Forget". Orthopedics. Hindawi Publishing Corporation. 2012. doi:10.1155/2012/439836.